Invisibility, Flight, and Immortality... The extraordinary tale of Marshmellow, the thief, over the secret "Witch's Treasures" that hold miraculous powers!! 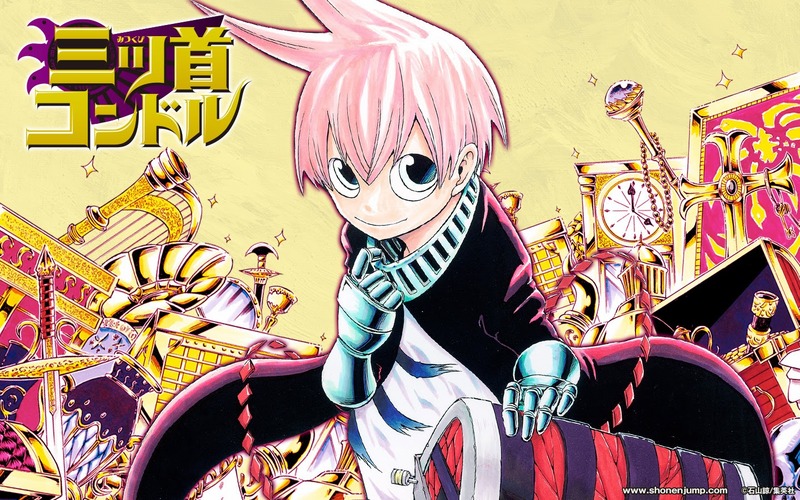 Mitsukubi Condor began in issue 33 of Weekly Shonen Jump by Ryo Ishiyama. The story revolves around a mysterious, powerful and skilled thief as he hunts for the Witch's Treasure. Ishiyama released Mitsukubi Condor as a oneshot in 2013. The oneshot showed much potential, the artwork was nicely done but the main plot could have been improved. The heroine, Cocoa had an annoying character design and this showed that Ishiyama had to rework a few things before his series could published. In the published series Cocoa has been replaced by Sue. She is a much more rounded character and her reactions to Marshmellow's actions are amusing. The plot is slightly different from the oneshot but overall Ishiyama has done an amazing job improving his work to this level. Just like in the oneshot Marshmellow's character design is one of a kind. But his eyes does make me think of Happy from Fairy Tail. Also the relationship and interactions of Marshmellow and Sue does remind me Natsu and Lucy from the first couple of chapters of Fairy Tail. Mitsukubi Condor does seem like an interesting series and one can only hope that it continues on. what happened to this series? did it get cancelled or moved to other magazine?